ColourPop Disney Designer "It's a Princess Thing" Pressed Powder Shadow Palette ~ $20.00 US. Get red carpet ready with the pièces de résistance of the collection, our first 15 pan shadow palette inspired by the iconic Disney princesses. These soft romantic shadows will add a touch of glam to any look to make you photo ready. 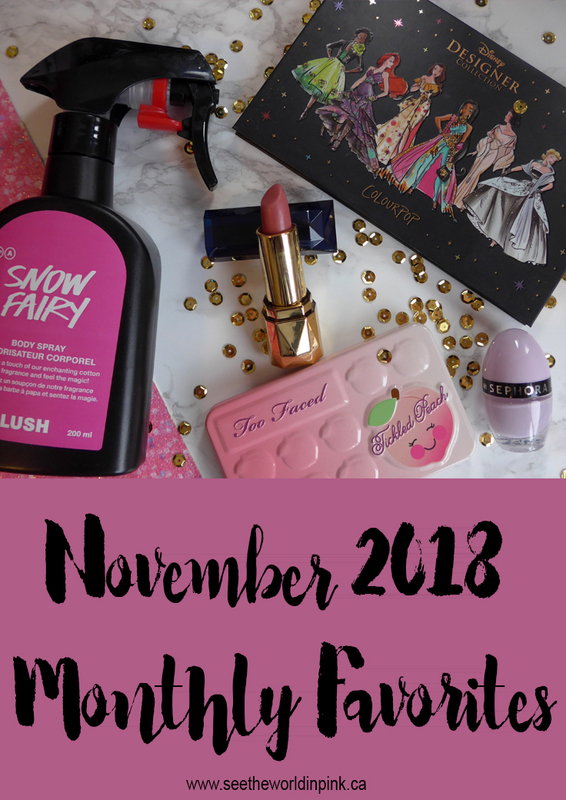 I was super excited about the ColourPop and Disney Designer collection when it was announced - it is so beautiful! The packaging is just divine! You can see my thoughts on the whole collection here, with a full try on! So, this is a very simple packaging in colours and is so easy for every day wear; but, this palette has some seriously stunning metallics and deep shades to make it quite versatile! It's so pretty and the quality of the ColourPop pressed shadows is really great! Posh Couture Cosmetics - Custom Lipstick ~ $60.00 CAN. This was a total custom lipstick experience - Posh Couture mixes the lipstick in front of you until the colour is perfect. I went for the perfect my lips but better shade for me and I love it. i've never worn a lipstick as much because I can wear this absolutely anywhere! Plus, it's a very comfortable formula! So good! If you are in the Edmonton, AB area, you should absolutely check this out! You can see my whole experience and pictures of the whole process here! Too Faced Tickled Peach Mini Eyeshadow Palette ~ $32.00 CAN. A bite-sized peach-infused eye shadow palette. Be sweet as a peach with this ultimate purse-ready palette of eight creamy matte and shimmer shadows inspired by Too Faced’s bestselling Sweet Peach Eye Shadow Palette. Oh man, maybe a couple of palettes seem excessive; but, this was another amazing palette this month! The formula is great and it's the perfect palette for every day wear. But again, this has really pretty metallic shades and makes gorgeous eye looks! Such a good mini palette - I love it! You can see it swatched, compared to the original Sweet Peach palette, tried on and reviewed on my post here! Collection Color Hit Mini Nail Polish in Lilac Fantasy ~ $6.00 CAN. A long-lasting nail polish in vibrant colors with five-day shine. It's not often that I include nail polishes in my favorites, because I'm constantly changing it out. But, this formula was really good! It went on really well - not streaky or anything and was fully opaque in 2 coats, even with a lighter shade. It lasted well and didn't chip until day 6 after playing 3 games of volleyball! It just wore so well, and this shade is gorgeous! The only thing is, I wish they weren't these little mini bottles! What have you been loving this month? I'd love to hear!